Hey guys, Sorry about the lack of the fishing and info reports this week but between moving house,guiding and sorting family matters things have been fairly busy.Â I am lucky enough to have my Dad over at the moment and he being a keen fisherman we have found time to have short sessions on different rivers in Taupo. The Waytahanuie still seems to be very productive if you are willing to walk and move from pool to pool fairly quickly to find the pods of trout. The fish seem to be moving through fairly quickly and keeping up with groups can be hard day to day. They may be moving so quickly and not holding up like usual because they are spawning traditionally late and want to get on with it? Dad and I fished the upper reaches to the Gordon Williams pool and managed to hook 6 between us which were in pretty good condition. I personally hooked and lost the largest trout I have ever had dealings with which left me in a bad mood for couple of hours. 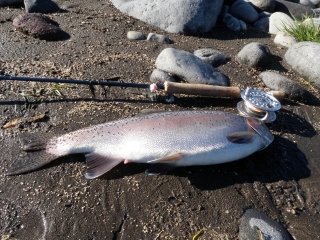 We both had a good look at it as we sight fished it and thought it would be at least 12lb, the way it fought confirmed that it wasÂ a huge fish before I made a mistake and it wrapped me up in the logs against the bank.”Better to have hooked and lost to not have hooked at all” I don’t know about that. The rip seems to be hot and cold but I have heard some great reports of after dark action using black night flies or lumos which mens they are at least thinking of pushing into the river so things are looking really positive for this river and the next few weeks should continue to be good. South Island Dave landed a 7lb Jack in great condition from the mouth of the TT which pulled him around the lake for twenty minutes which is great to hear. This mouth produces some big fish but they seem hard to locate when they run in this river? They also seem to be motoring to the headwaters in this river aswell and you really have to be in the right place at the right time to do well in here at the moment. I spoke to Dennis Flowers on Thursday and he hadÂ a couple of fresh fish not far from the car park using small glo bugs so there could be a few fish about for the weekend . The Tongariro continues to produce both goodÂ and average fish with the fresh hens being superb and the jacks for some reason being a little small and dark in colour. I have heard many reports after last weekends mayhem of guys continuing to catch 20 plus fish in the lowerÂ river but personally I was not able to come across such numbers. The boys under the bridge still seem to be banging limits out pretty quickly at first light from under the bridge before work using glo bugs tied by Steve at Creel Tackle House. I was lucky enough to be guiding Eric and Ryan from Chicago on Thursday which had not fished before and was looking for a good Father Son day out. Fishing was hard for us and I even got skunked in my favourite pool down the true right of Judges and surrounding little runs which made me think that the upper river might be holding the fish from the weekend. Eric took me aside and mentioned that it was his son’s day and I should spend more time with him trying to get him into a fish as it means alot to 13 year old boy. IÂ think he regrets mentioning that as Ryan went onto to hook ad land three good fish just after lunch from the Cicada pool and the Fan pool. I found the upper river to be fairly quiet ad it was good to get away from the crowds lower below the bridge. I suppose anglers were trying to find fresh fish which is very smart of them to be down that way but sometimes it’s nice to have somewhere to yourself for a hour. 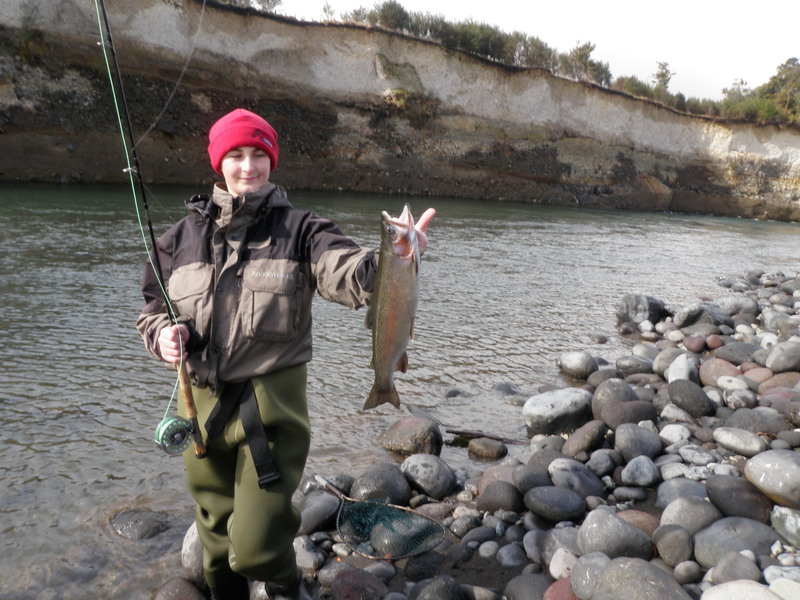 Dad went down the braids and did fairly well in the Plank pool with two other anglers from Napier where they landed 3 or 4 fat little hens so they are still trickling up obviously. 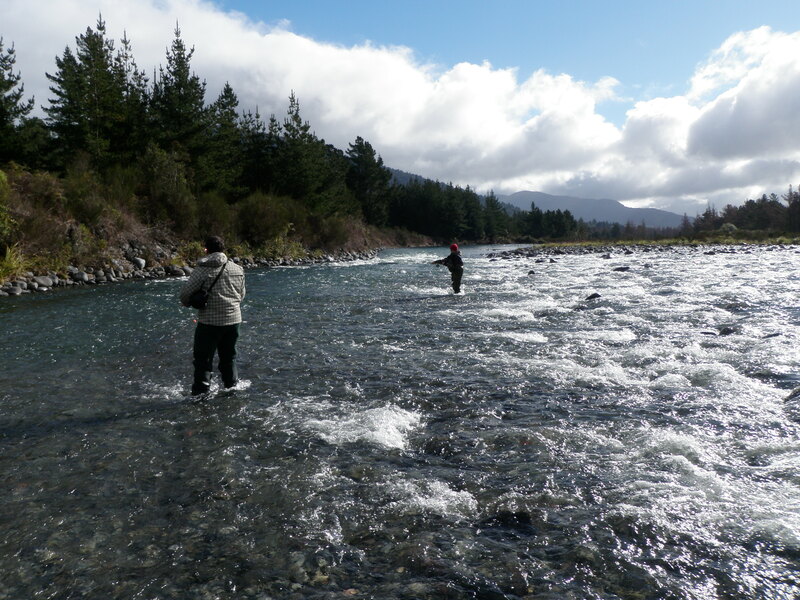 Turangi had some good rain on Wednesday and the river rose a little which may have encouraged a few more fish to push over the lip and into the lower river and keep anglers interested. It is most certainly the time of year to have a good range of glo bugs in the box but don’t forget about keeping the stocks of naturals up aswell as they still get thrown in the river by me on every trip or outing. Green or White Caddis are a favourite of mine and can be deadly if the trout are looking for something different. Sometimes after using glo bugs in the same pool it is worth running the naturals through, you will be surprised how they can change their minds with something that they are used to seeing. 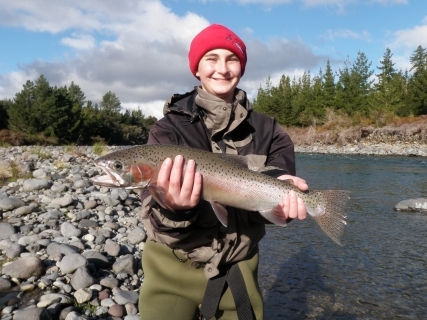 Angling pressure on Taupo rivers are busy at the moment so lets all make sure we get along and enjoy the wonderful sport together, plenty of water to go around.